I read the obituaries every Sunday. I'm not sure how I developed this morbid fascination with the recently deceased. Maybe as a writer I enjoy the stories people leave behind. I think too, that in this day and age of fake news, angry politics and instant, relentless, incessant streams of information and 'advice', the obits offer a slice of realism, a chance for me to read about people who can no longer influence or sway my opinion by way of their social media posts. One small headshot and a two inch long bio. That is all that remains of us in the end. You might think that perusing the obituaries every Sunday would be a depressing, macabre meditation, but for me, it's quite the opposite. It's invigorating. It's energising. It renews my faith in humanity. The obits offer up the real inhabitants of our world — our neighbours and bosses, our friends and partners, our mothers, our fathers, our grandparents. Death is incredibly inclusive and unfussy: coal-miners, fishermen, teachers and rabbis, executive secretaries and restaurant managers. A high school senior. A second grader who loved to fly kites. These people are not the airbrushed celebrities, political blowhards or violent predators that often adorn the front pages of the social media platforms by which we ingest news these days. The obituaries do not promote fear, anxiety or frustration. They do not ask us to donate, cast a vote or click. We do not have to like or share. Adele was a strong mother, practical, clear-minded, and devoted to her family. In retirement Adele tutored students, trained teachers, drove for Meals on Wheels, worked for the Children's Consortium, and supported numerous musical organisations. Ed enjoyed taking long walks with his beloved dog, Maggie. "Real people who make up this world are lovers of puzzles and dancing, mothers who pay their way through college, religious leaders who work in hospitals, gardeners who bake homemade cinnamon rolls." The list goes on. Joe donated his eyes to the Eye Bank. Forest was a man always guided by his religious faith, an ordinary man who gave extraordinary effort. Charles was devoted to his wife of 52 years, whom he left behind. Jack's dedication to community service and the needs of others guided his life. Real people who make up this world are lovers of puzzles and dancing, mothers who pay their way through college, religious leaders who work in hospitals, gardeners who bake homemade cinnamon rolls, workers who dedicate 30 years of their lives to the Department of Motor Vehicles. According to the obituaries we are surrounded by people who donate their time to help develop housing for low-income senior citizens, people of strong faith, people of keen business sense, avid bowlers, golfers and travellers. We are living among millions of people who love spending time with their friends and family. People who recognise the fact that their greatest role on earth is being a mom or a dad, a brother, a sister, a nephew and aunt. And here is the exciting part: all of these strongly influential people have left a long list of friends and family in their wake. Hundreds of thousands of people living with their same ideals, goals and life perspective. People doing (and acting) good. These are the humans that surround us today! They live, they breathe, they pray, they sing. They serve as board members. They spend summers in Canada. Real people living tangibly remarkable lives. People by which we can pattern our own lives. It's easy to lose focus on what is real and important in a speeding world full of instant news and tabulated views. A world full of embedded video and endless links. A world where a person's worth is being determined more and more by the thumbs-up at the bottom of the screen. A world full of virtual friends, 'must-see' video clips, and constant Breaking News. It's easy to forget about those that inhabit the world outside the screen. The world we can actually touch; the world we can actually feel, the world happening in real time. It's nice to know that I have a weekly reminder about all the good that is happening all around me. It's nice to know I'm surrounded by good people, too. Daniel Rose teaches language arts to 13 year olds in upstate New York. Terrific piece of poetry! Beats so much of today's poor prose that is offered up as poetry. Why? Because it stirs genuine emotions and is immediately memorable. What a great job you have, Daniel, very special to work with 13 year olds. I know how wonderful is my community, but a gentle reminder never goes astray. 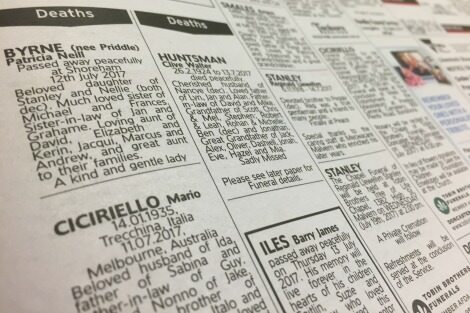 The Death Notices are, probably, the only things in our newspapers which can be believed. The formal obituaries are greatly enjoyed because people love good stories -- and what are better than the lives of interesting or influential people?